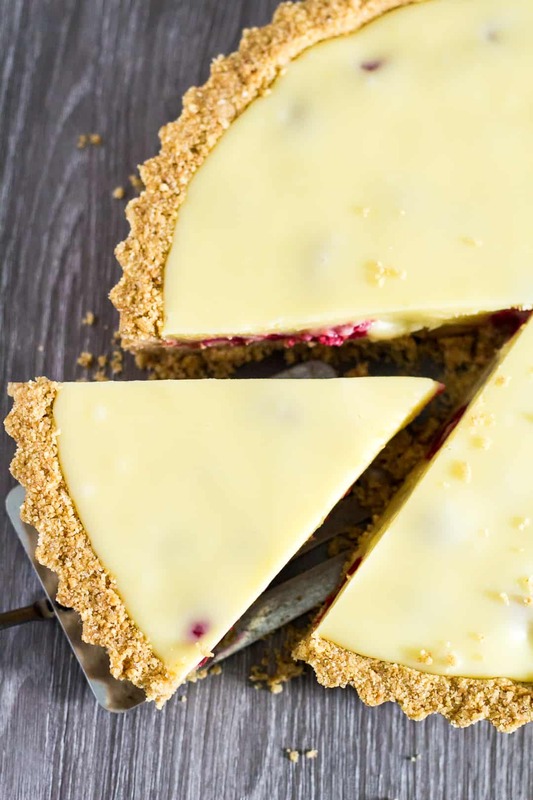 White Chocolate Raspberry Tart – A deliciously rich and creamy no-bake white chocolate tart recipe that is stuffed full of fresh raspberries, and has a sweet digestive biscuit crust! I have the most perfect no-bake summer dessert for you. 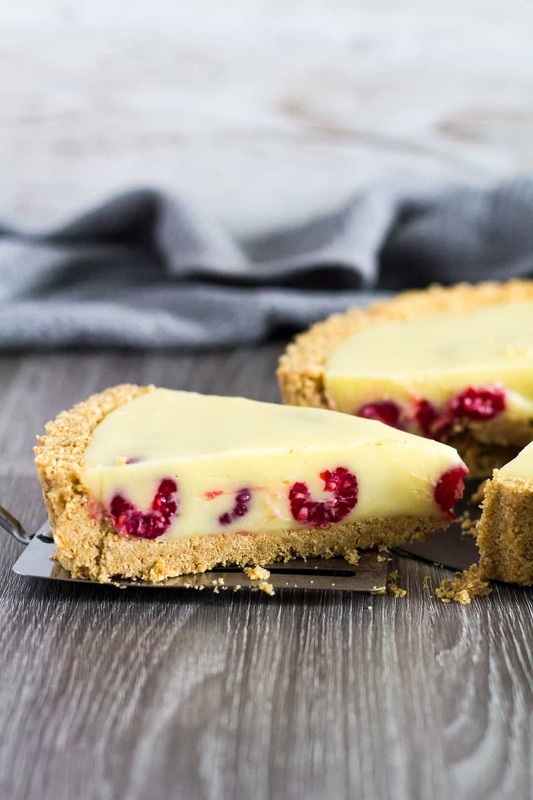 Love white chocolate and raspberries? Then you are gonna love today’s recipe. My family could not stop eating it! 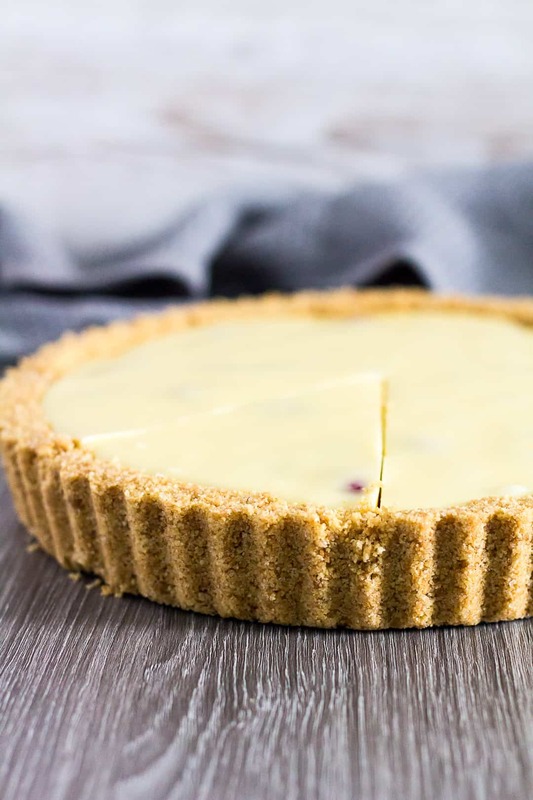 This white chocolate tart is not too rich, and has just the right amount of creaminess and flavour. Throw in some fresh raspberries for the ultimate summer dessert that everyone can enjoy. To make this tart, start by making the biscuit crust. Simply stir together the crumbs and sugar, then mix in the melted butter. 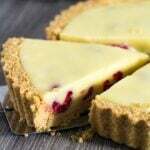 Press the crumb mixture into an un-greased 9-inch fluted tart tin, and refrigerate whilst you prepare the filling. For the filling, place the white chocolate, cream, and butter in a microwave-safe bowl, and heat in 20 second intervals, stirring after each one, until melted and smooth. Place the raspberries on top of the crust, then pour the chocolate mixture over the top, spreading out to the edges. Refrigerate until completely set – about 2 – 3 hours. How long will this white chocolate tart last? 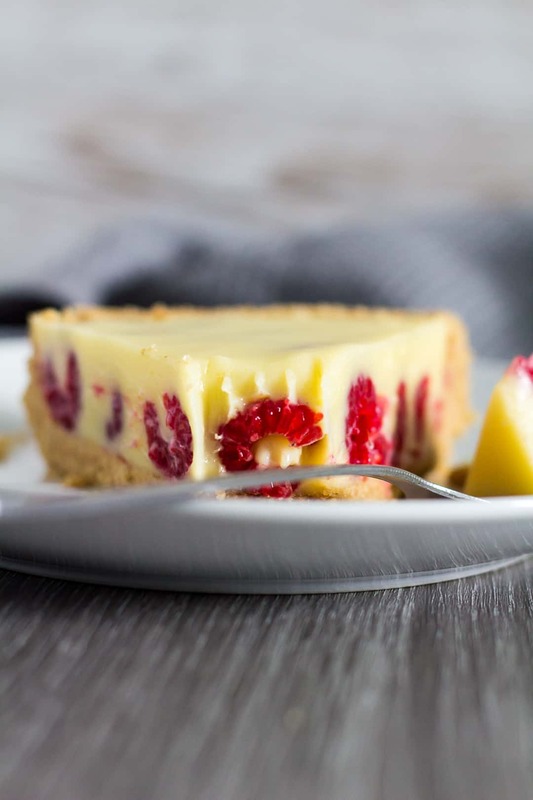 This tart and any leftovers can be cover tightly, and kept refrigerated for up to 3 days. Can I freeze this tart? This tart freezes well for up to 3 months. Thaw overnight in the fridge before serving. 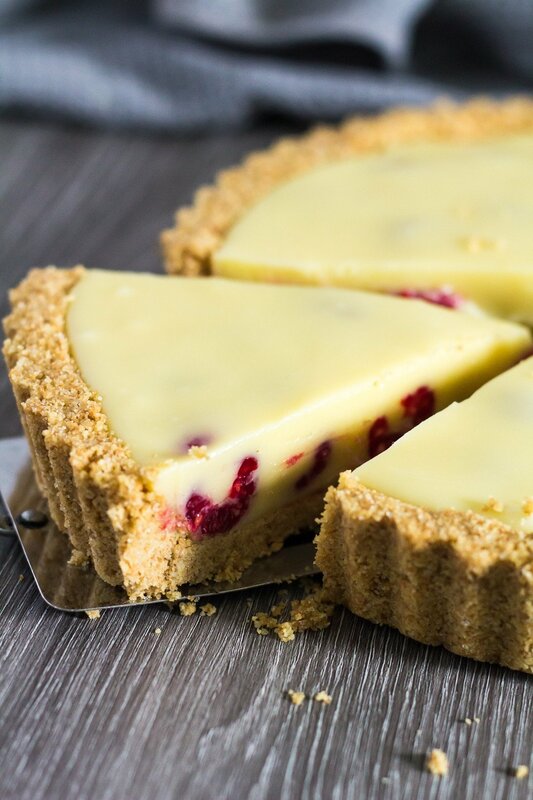 A deliciously rich and creamy no-bake white chocolate tart recipe that is stuffed full of fresh raspberries, and has a sweet digestive biscuit crust! Stir together the biscuit crumbs and sugar. Add the melted butter and mix until all the crumbs are moist. Place the chocolate, heavy cream, and butter in a microwave-safe bowl, and heat in 20 second intervals, stirring after each one, until melted and smooth. 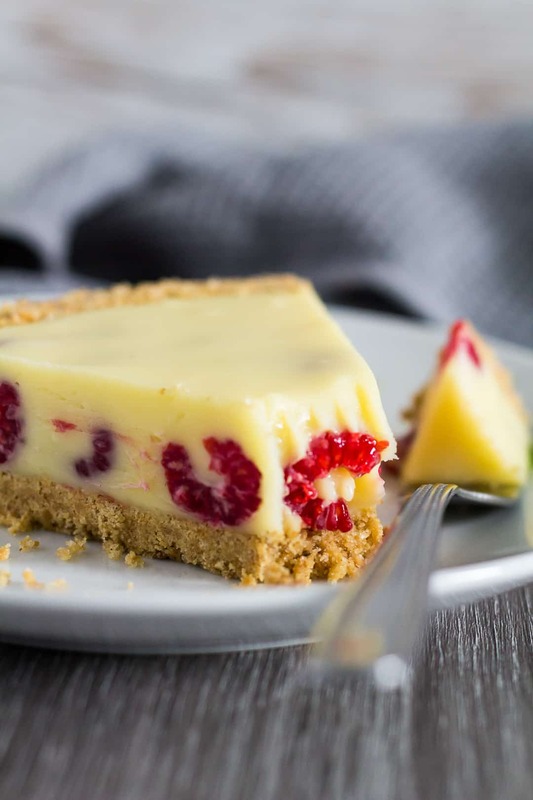 Place the raspberries onto the bottom of the crust, and pour the white chocolate on top. Refrigerate until firm - about 2 hours. Leftovers can be cover tightly, and kept refrigerated for up to 3 days. This tart also freezes well for up to 3 months. Thaw overnight in the fridge before serving. Absolutely delicious and easy to make ahead! Perhaps 3/4 of the crust recipe would be sufficient? Hi Susan! If you’d like a thinner crust, you could definitely do 3/4 🙂 Enjoy! Is double cream more or less the same as sour cream? Unfortunately I am not really sure what the equivalent it would be in Romanian. Hi Ana! Double cream is the British term for heavy or whipping cream in the United States, so not the same as sour cream.